The Cheetah is surprisingly more endangered than other African cats. 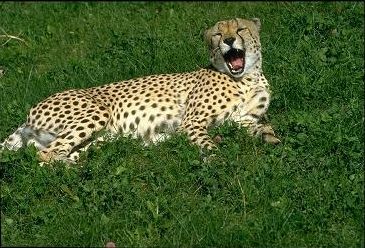 There are only around 5,000 Cheetahs left in the wild. Many Cheetahs are starving due to not having the privacy to hunt. Also a major factor of Cheetah populations going down is their vulnerability to disease. This is because during the Ice age Cheetahs were wiped out apart from 1 pregnant female. Therefore they have little genetic diversity although zoos around the world have been regularly swapping Cheetahs in an attempt to tackle this problem. Cheetahs used to be found in Africa, Asia and parts of Europe but now are only found Africa. Despite being a predator on the plains it can fall prey to other cats, Leopards will eat Cheetahs while Lions will kill and leave the body for the vultures. Cheetahs normally have about 2-6 cubs in a litter although probably only half of them will survive. This is beacuse of predation by hyenas, leopards, lions and even large eagles. Cheetahs will eat anything they can catch and take down. Their most common prey are Thompson’s Gazelles or tommy that are abundant on the east african plains. Also they prey on smaller antelopes such as Dik-Dik, Duiker and Reedbuck. Male Cheetahs that live in groups called coalitions are able to tackle larger prey such as Topi, Impala and Hartebeest as well as young Wildebeest and Zebras. Cheetahs have to eat quickly at meals because they are often bossed away by scavengers like Hyenas. Hyenas are stronger and more powerful than Cheetahs and a fight would only end in one result, a dead Cheetah. The Cheetah is the fastest land mammal on earth and to catch its prey it will stalk the prey to around 70 metres. Then it will take off and after a few seconds the Cheetah is running at its maximum speed of 65 miles per hour. It can only hold this speed for around 15 seconds. It will then suffocate the prey until it is dead.